The Nahuatl Painting from the Balsas River basin in Guerrero State is one of the most appreciated and well-known folk painting styles in Mexico. Flowers, birds, deer and rabbits or intricate scenes that narrate the community's celebrations, religious beliefs and everyday activities are beautifully painted on amate paper, pottery and wooden figurines. 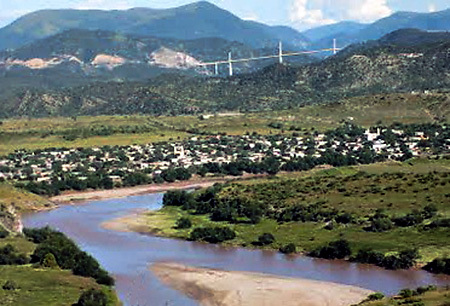 Balsas river at La Mezcala region. 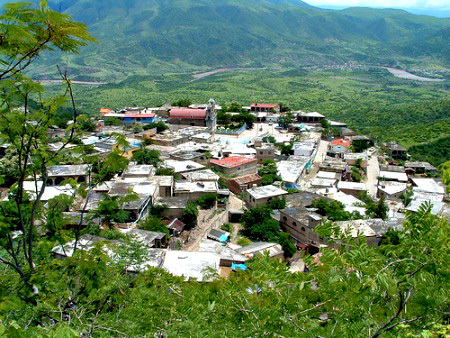 The region known as La Mezcala is found on The Rio Balsas basin in Guerrero State. The area is home to the biggest Nahuatl community in the State. 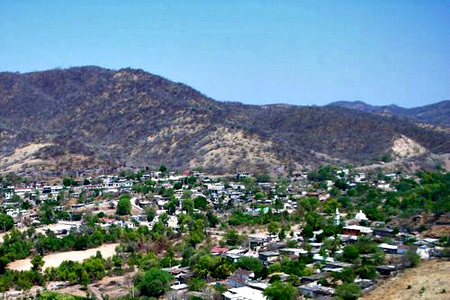 The Nahuatl people have lived in the area since 1250 approximately. They are believed to be a branch of the Nahuatls known as the Aztecs or Mexicas that founded Tenochtitlan. In the years before the Spaniards conquest the Nahuatls from the Balsas gave as tribute to the Aztecs great amounts of corn and beans. 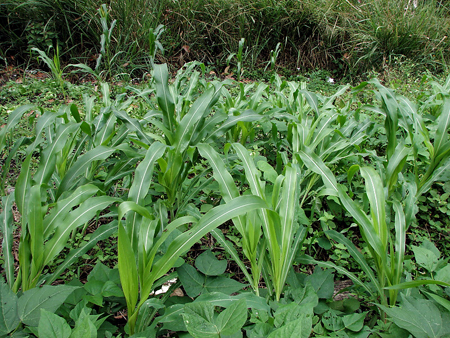 They use the milpa system (corn, bean and zucchini sown together helping one another grow) implemented in the area 4000 years ago. Chile pepper, cantaloupe and watermelon are sowed as well. All the harvest is for auto consumption. Twenty-three villages share not only their language but their traditions and culture. Like many other communities in Mexico the members contribute to the well-being of the community with voluntary work. Strong social bonds help them preserve their culture and keep their land. The agricultural cycle and the traditional rituals and celebrations mark the year activities. There are Catholic celebrations such as Patron saints celebrations, Christmas, Holy Week and Day of the Dead and there are rituals held to insure a good harvesting. These rituals are called Culto a los Cerros or Cult to the Hills. 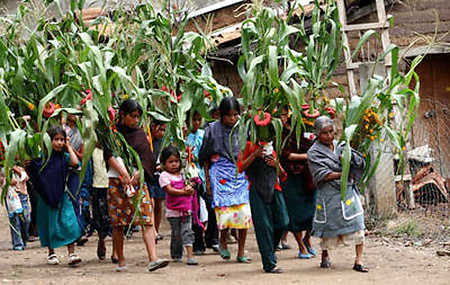 Corn plants, food, flowers, incense and candles are taken to the hilltops by girls and young women. The first ritual is held form April 21 to May 3 and it is to ensure plenty of rain, it is the beginning of the sowing season. The second Ritual is held in august to protect the milpa from plagues and the last one is done in September 13 to celebrate the harvest of the first corn ears. The Nahuatls from the Balsas were taught by their ancestors the earth and the gods have to be fed, to give them back what they have given men. 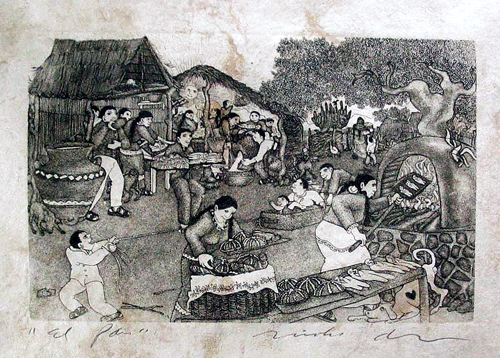 They developed a unique folk painting style that brought prosperity and recognition to their communities. However their way of living did not change and the folk art making is alternated with the harvesting and cultural activities. Pottery production in Oapan and Ameyaltepec dates from pre-Hispanic times. 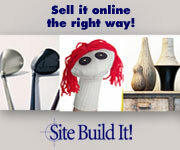 Women made pots and plates, ceremonial pieces and human and animal figures used as toys. This pottery was traded with other communities in the area. In the 1950's foreign tourism began coming to Mexico; Mexico City, Taxco, Acapulco and Cuernavaca, became outlets for the Balsas crafters. The pottery was transformed by the new customers taste. The colorfully painted pieces sold better. Hence painting styles became colorful, decorative, featuring fantasy animal figures, some nonrealistic humans and plenty of floral and geometric designs. Transporting the pottery was not easy, some artists would rather travel to the tourist destinations and paint there. 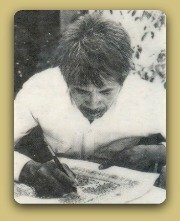 In 1962, Pedro de Jesus itinerant folk artist from Ameyaltepec invited neighbor painter Cristino Flores Medina to go with him to Mexico City. In Max Kerlow's gallery they painted wooden figures.There they met Felipe Ehrenberg an eclectic artist that introduced them to Amate paper. Amate paper gave the Balsas folk painters the opportunity to develop their art from utilitarian pieces to pure aesthetic paintings. 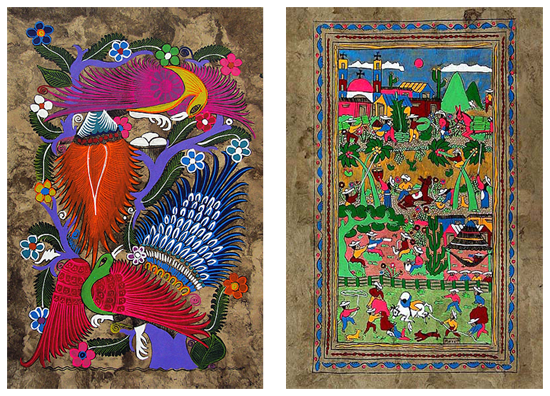 Soon the Nahuatl painting evolve into intricate drawings that represent the community activities and traditions. 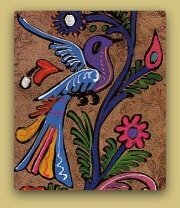 By 1970 Cristino Flores and Pedro de Jesus had gained national recognition for their talent and were considered pioneers in the Nahuatl folk painting style. 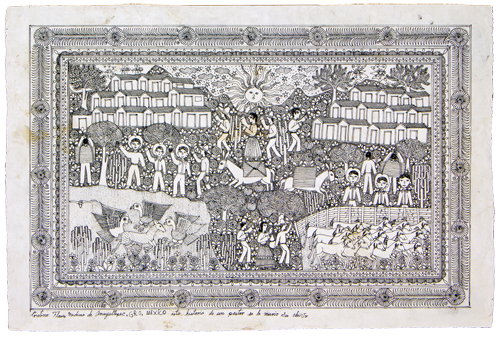 According to the University of Veracruz Populart essay, the Amate "allowed Balsas's folk painters to become chroniclers of their culture, giving them the opportunity to develop one of the most important folk painting styles in modern times". From the Painting school developed in Ameyaltepec rose internationally known artist Nicolas de Jesus. The Nahuatl painting from the Balsas is done on amate paper, on pottery and on wooden figurines. Amate Paintings are made in brown and white bark. Brown paper usually features colorful paintings with flowers, birds, deer or rabbits and everyday stories from the community such as fishing, hunting and harvesting. White Amate paper is used in more intricate drawings made with pen and ink representing cultural events, celebrations and daily activities. 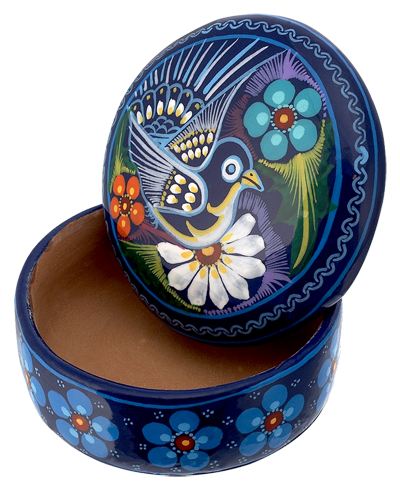 The traditional painting styles in the painted clay include flowers, birds, deer and rabbits or scenes with the community celebrations or everyday activities. 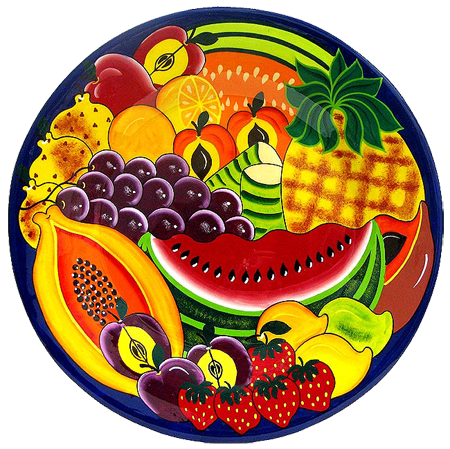 In the recent years a new painting style featuring still life with colorful fruits and vegetables has arose. These paintings are more realistic as the drawings are tridimensional opposing the more traditional styles that are made in two dimensions. This style is mostly used in plates. 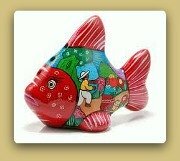 Wooden fish have two painting styles. Larger fish are decorated with stories about the community activities, traditions and celebrations. 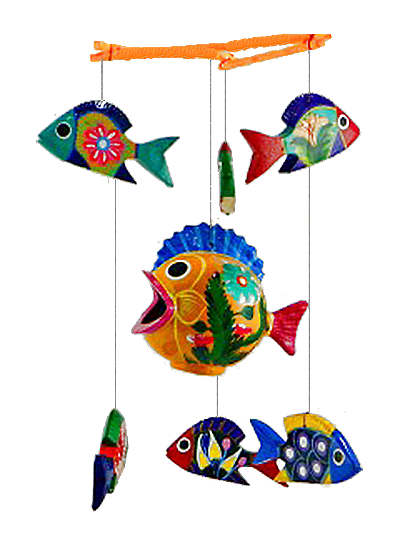 Smaller fish are painted with colorful flowers, birds and other animals and commonly use to form mobiles. It has a pre-Hispanic pottery tradition and was the first place where painted clay was made. 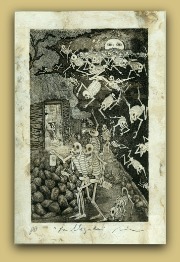 Hometown of Pedro de Jesus and Cristino Flores Medina pioneers in the amate paper paintings. The most significant evolution in the Nahuatl painting style was accomplished there. Located next to the federal highway from Mexico City to Acapulco became a natural outlet for the region crafts. After a dam construction, the community was left without water and farmers became full-time artisans. Nowadays Xalitla is a producing and selling center for many Guerrero folk art styles.